With the growing number of network connected devices in the market, the ability for a fast and simple scalable support of new devices is essential. Most of these new devices are expected to have common functionalities per device type (e.g. bulbs, sensors, cameras). The Weaving API translator features a very clear and easy to use language that allows us to easily add new devices to be managed through their common device type interface. The translator is executed in run-time and translates the API of the newly introduced device to the abstract service interface already implemented. Weaving translator, is attempting to solve a major problem of the IoT service layer. In order to be able to monitor and control different devices and different services, We must be able to communicate with the device by using the device’s own specific interface or API functionality. Several standards are emerging, but many devices do not adhere to any specific standard and implement a proprietary interface. Weaving Translator is taking advantage of the fact that the number of services is an order of magnitude smaller than the number of devices. For example, the lighting service is exactly the same for dozens of different lighting devices each with a different API. Weaving Translator expresses the device API in a collection of very simple terms that are textually represented in scripts called binding scripts. These binding scripts can be added to the service in a very simple way allowing a very easy and fast support of new devices. Once a specific device is identified, the translator translates this generic service interface to the specific device proprietary API. Weaving translator allows a single representation of the different services, exposing an extremely simple and straight forward service data model using JSON data elements. It also enables event driven IoT interworking between any two different sensors and actuators allowing them to communicate with each other. 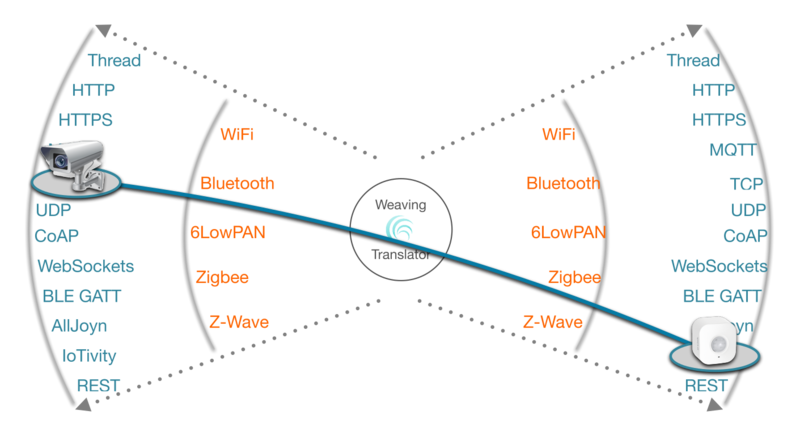 WeavingThings connectivity solution operates on three different levels. The specific device connectivity level, connectivity with the device’s dedicated hardware hub, and lastly, connectivity with the IoT system or service cloud. The specific device connectivity is a direct connectivity between the main gateway running Weaving Agent and the device. In this case communication with the device is achieved using its own physical RF protocol, higher level protocols and API. Connectivity with a device behind a dedicated hub is also supported. Assuming the main gateway lacks the required hardware interfaces, and the device has its own proprietary physical communication using a hardware hub, WeavingThings can connect and communicate with the dedicated hub, allowing a complete connectivity path with the main gateway. The last approach allows connecting a complete IoT service system, creating a cloud-to-cloud communication between a cloud service and the main system. This approach creates a centralised data channel that is available and managed entirely by the main service or management system to interconnect different IoT systems into a single centralised system.